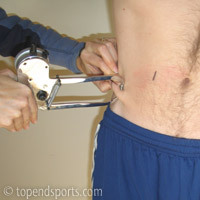 The supraspinale skinfold site is one of the common locations used for the assessment of body fat using skinfold calipers. It has previously been known as the Suprailiac site. See the complete list of skinfold sites, and the general procedure for taking skinfold measurements. 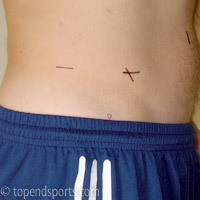 The intersection of a line joining the spinale (front part of iliac crest) and the anterior (front) part of the axilla (armpit), and a horizontal line at the level of the iliac crest. The pinch is directed medially (towards the centerline) and downward, following the natural fold of the skin (at an approximate angle of 45 degrees). This site is used in the Heath-Carter somatotype measurement system. This site has been called suprailiac previously, not to be confused with the iliac crest site.